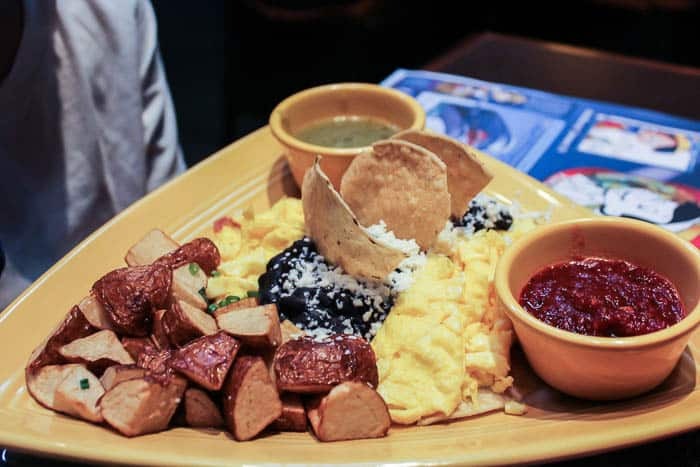 This Las Ventanas breakfast review is based on my experience when visiting the restaurant in November 2017 with my family. Las Ventanas is a restaurant located inside, on the first floor, of Disney’s Coronado Springs Resort. We had made reservations for this meal, but I’m not sure there is really a need to. There were only a few tables full the entire time we were in the restaurant. It could be that this restaurant was a bit slower because there was a buffet-style restaurant right around the corner. It definitely wasn’t because of the food – everything was really good! For whatever reason, the idea of “ancient grains” sounded really good the morning we ate at Las Ventanas. 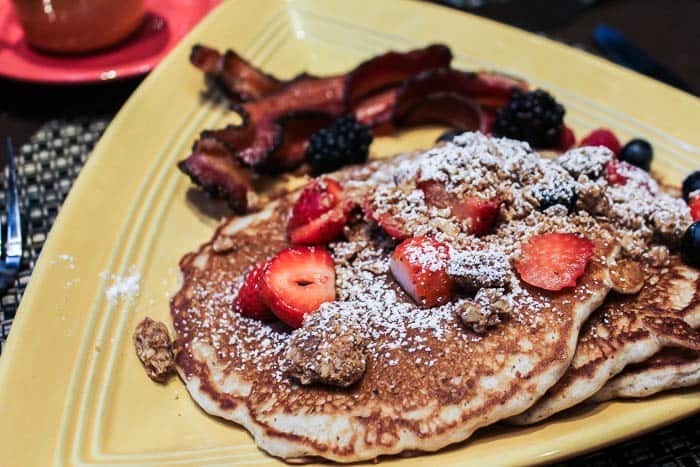 Three Ancient Grain Pancakes came topped with granola, berries, and a little powdered sugar. On the side was maple syrup and I chose the Peppercorn Bacon for my choice of breakfast meat. These were so good! I ate every bite! This breakfast consisted of two eggs served over a cheese quesadilla. It came with black beans and queso fresco. He asked that the salsa roja and salsa verde be served on the side because he wasn’t sure he would like them. This was a big breakfast, too much for him to eat, but he really enjoyed it! My fiance ordered the Vegetable Omelet. It came stuffed with spinach, tomatoes, and mushrooms with asiago cheese. It was served with a side of scallion potatoes. 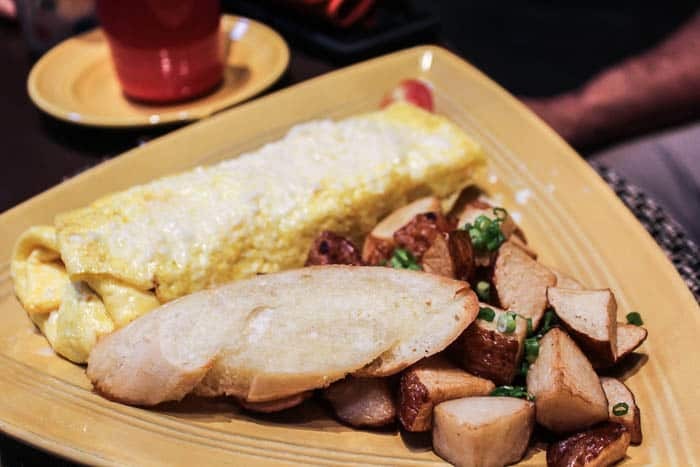 It was a good size omelet and plenty filling, especially with the side of potatoes! Overall our experience at the Las Ventanas was great! I’m not really sure why this restaurant wasn’t nearly as busy as every other one we visited during our trip, because the food was delicious and I would definitely recommend trying it! Because the menus are always changing, I can’t guarantee the same selections will all be available as in this Las Ventanas Breakfast Review. To see the current Las Ventanas menu and prices, click here!